C&K’s PT series sealed power toggle is ideal as a rugged, panel mount, multi-function switch, for harsh, dusty, dirty, wet conditions. The switch is available now from TTI Europe. Featuring a patented single piece injection moulded panel and toggle seal the switch is ideal to meet the performance requirements for off-road construction, material handling, agricultural, and industrial equipment applications. The switch is designed with a high-strength, heat-resistant housing and has excellent oil and fuel resistance. 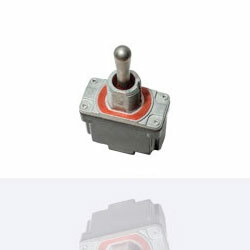 The switches have a versatile IP66/IP68 seal rating, are IEC/UL 61058-1 certified. They are also rated at 15A for maintained functions and 10A for momentary functions, making it simpler for engineers to include the switch into their designs.